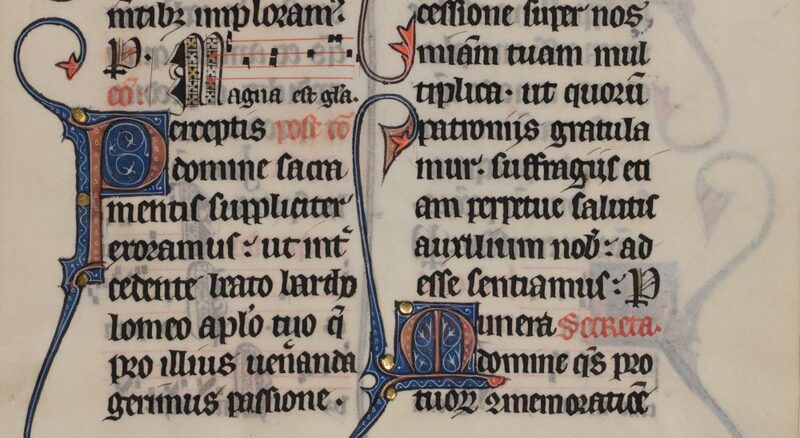 Leaf 15: “Missal: Missale Bellovacense.” Latin, 13th century. Otto F. Ege: Fifty Original Leaves from Medieval Manuscripts. 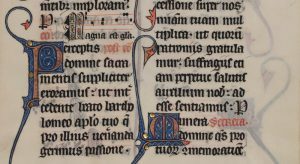 “Otto F. Ege: Fifty Original Leaves from Medieval Manuscripts” is a digital collection published by Stony Brook University Libraries in November 2017. An educator and book seller, Otto F. Ege (1888-1951) is perhaps best known for separating and systematically removing pages or leaves from books. A self-proclaimed biblioclast or “book-breaker,” Ege rationalized that disbinding volumes provided the masses with opportunities to study and to have tangible experiences with authentic medieval manuscripts. As a result, modestly funded libraries and smaller institutions were able to acquire manuscript specimens at a reasonable cost. The digital collection features photographs of the Ege-compiled portfolio “Fifty Original Leaves from Medieval Manuscripts, Western Europe, XII-XVI Century.” Special Collections owns portfolio “No. 19” of the 40 unique sets created by Ege. The rectos and versos of each leaf, context cards, and housing have been photographed in accordance with Technical Guidelines for Digitizing Cultural Heritage Materials: Creation of Raster Image Files (Federal Agencies Digital Guidelines Initiative, Thomas Rieger, ed., September 2016) and described in accordance with Dublin Core and VRA metadata standards. The University Libraries created the collection to increase accessibility to the manuscripts and to aid efforts by students and scholars to “virtually” reconstruct the books from which the scattered leaves were taken. Leaf 47: “Book of Hours: Horæ Bretæ Mariæ Virginis.” Latin, 15th century. Otto F. Ege: Fifty Original Leaves from Medieval Manuscripts.